Engine room hatch opens by a simple press from one foot only. Very neat engine room, all accessible and organised. Washing machine stored in the engine room. 2 emergency hatches serving as ventilation too. Lots of storage, dressing table, little setee. going down to the galley area, 3 gas burner, micro wave, one sink and a huge domestic fridge and freezer installed to allow year round living on board, it has been installed half way into the heads and has replaced the shower. Shower can be re installed by moving the fridge and putting a new wood paneling in the wall. A sliding door leads to the forward cabin, with central double berth (140x2m) and headroom of 2.03m, ensuite electric heads and basin. Lots of storages and cupboard, bright interior with opening hatch. The vessel has already cruised the full length of the Canal du Midi in 2017 included Capestang bridge. 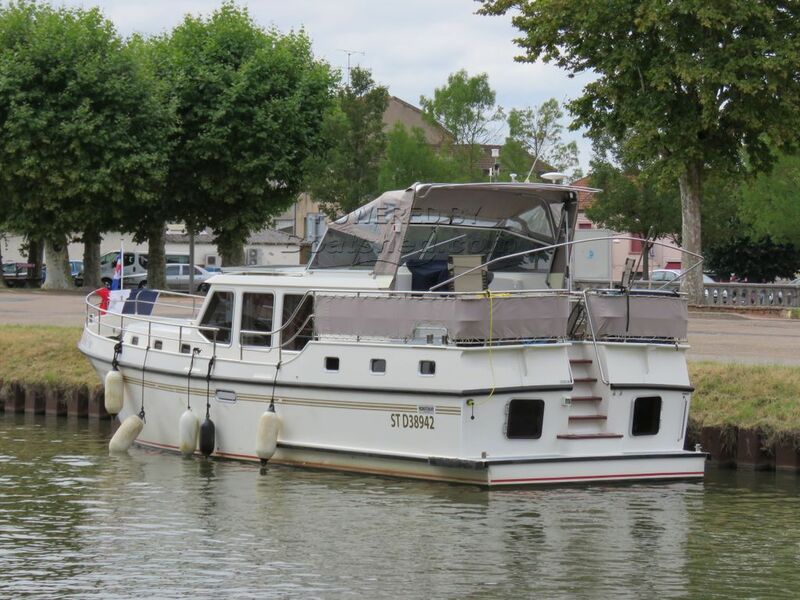 Dutch steel cruiser for sale in France. Boatshed Bourgogne is pleased to offer this PEDRO LEVANTO 44 built and finished in 2007, only 2 owners since new. A very comfortable cruiser used currently by a miticulous retired professionnal captain as a live aboard motor cruiser. He still cruises around Burgundy and will be happy to deliver the boat if requested. Bright and airy interior, double glazed large and deep windows, open saloon to the forward galley and dinette, a domestic fridge has taken place to replace the original little fridge under the sink, so an aperture has been made in the shower heads next, shower is not available for the guest cabin, but could be re installed. Only 1056 Hours engine runs. Spotless engine room as you can see, with a very easy engine hatch opening just by pressing with the foot. Double helm with a convivial fly bridge, and a swim plateform and its cockpit shower accessible by steps not a ladder, and 2 emergency escapes serving as ventilation for the aft cabin. Last antifouled in September 2017. A great cruiser, ideal for a couple and guests, or used as a cruising live aboard. Will go anywhere on the inland waterways, fly bridge screens and arch down. This Pedro Levanto 44 Live Aboard Dutch Steel River Cruiser has been personally photographed and viewed by Magali WHARMBY of Boatshed Bourgogne. Click here for contact details.